New York City Department of Transportation (DOT) Commissioner Janette Sadik-Khan and Paul Warwick Thompson, Director of the Smithsonian's Cooper-Hewitt National Design Museum today announced the 10 finalists in the City's international design competition to establish a new standard for City sidewalk bicycle parking racks. With support from Google Inc. and Transportation Alternatives, the competition drew over 200 entrants from 24 states and 26 nations who sought to develop attractive, functional and well-designed sidewalk racks. The jury also selected two winners who generated new concepts for the competition's commercial and residential building bike parking component. The winner of the sidewalk rack competition will be announced October 24 during Cooper Hewitt’s National Design Week. Following the DOT's strategic plan, the City intends to double bike commuting by 2015, in part by expanding bike parking and making bicycling more convenient and attractive. 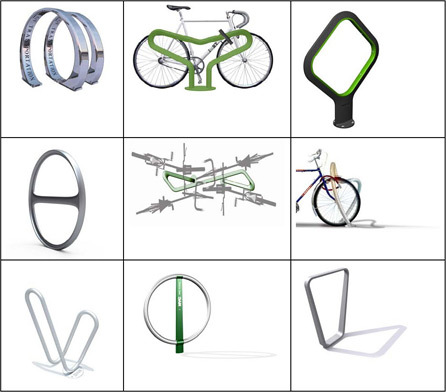 "These finalists each demonstrate an understanding of how bike parking in New York City can be attractive, functional and secure," said Commissioner Sadik-Khan. "From among these intriguing designs, the competition jury will identify the one that best meets the City's needs for usable bike parking that will also generate greater interest in bicycle use in the City." The racks vary greatly, ranging from the simple and straightforward to the abstract. DOT intends to use the winning sidewalk rack as its new standard for bicycle parking. The City, which is in the process expanding bike parking at municipal buildings, will also consider using the winning indoor designs in its facilities. DOT may also choose to add other designs from the competition to the City design palette and allow their installation by other entities on public sidewalks. The prototypes of the sidewalk rack designs are currently installed at Astor Place, near the "Alamo Cube." Duplicates of each prototype will soon be displayed at locations across the City including in front of Borough Hall and P.S. 1 in Queens, Fordham Plaza in the Bronx, the New York Historical Society and the Brooklyn Academy of Music. The competition jury will select first-, second- and third-place winners next month. The first-place winner will receive an additional $10,000 prize (In exchange for the prize, the first-place winner will transfer intellectual property rights to the design to the City). The finalists selected by the six-member competition jury include an international cross-section of entrants including: Ian Mahaffy and Maarten De Greeve (Copenhagen, Denmark), Ignacio Ciocchini (Astoria, NY), Jeff Miller and Andrea Ruggiero (New York, New York ), Federico Otero (Lima, Peru), Harry Dobbs and Andrew Lang (London, England), Francis Bitonti (Brooklyn, NY), Sthephen Jaklitsch Architects PC (New York, NY), Baroni & Valeriani architecti (Florence, Italy), Next Phase Studios (Boston, MA), and Open Thread Design (Brooklyn, NY). The in-building winners are RSVP Architecture Studio in Brooklyn and Jessica Lee and Anthony Lau of London. The current CityRacks-there are more than 5,000 citywide- were originally designed 10 years ago. The Competition asked the international design community to create a modern and functional rack for the City of New York. Competitors were urged to consider the City's new bus stop shelters, newsstands, sheltered bike parking structures and public toilets serve as an exemplar of what the City seeks in street furniture meant to withstand the rigors of New York City sidewalks. The winning design will be announced at the Cooper-Hewitt during National Design Week (October 19-25, 2008), which celebrates the important role that design plays in all aspects of daily life through a series of public programs and a range of online resources for students, teachers, design professionals and the general public. Craig Nevill-Manning, New York Engineering Director, Google Inc. Images of the finalists installed at Astor Square follow. One additional design will be installed at a later date.